Rivers State Governor, Nyesom Wike, has charged Nigerians to be courageous and stop the emerging civilian dictatorship, which has become intolerant of political opposition. Governor Wike also tasked Federal Government to fight judicial and other corrupt practices with the seriousness they deserved, within the framework of the rule of law. He stated this yesterday, at the commissioning and handing over of new Port Harcourt Federal High Court complex to the Chief Judge of the Federal High Court, Justice Ibrahim Auta, built by the Wike-led administration, in a bid to improve dispensation of justice. The governor regretted the hunting and hounding of a small band of targeted judges to prison in Gestapo style, even before allegations against them were investigated. He said such actions amounted to political witch-hunt and practical strategy to browbeat the judiciary into submission. 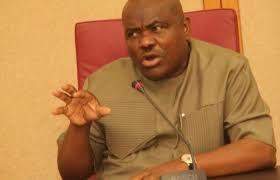 Wike stated: “It is my patriotic prayers for all men of courage and goodwill, irrespective of partisan affiliations, to intervene to stop the present cascade into hell before we all lose our liberties to an emerging civilian dictatorship that is increasingly becoming intolerant of political opposition. Wike, while handing over the complex to the Chief Judge of Federal High Court, Justice Auta, said that his administration resolved to strengthen the judicial system as a way of promoting good governance and making the State a regional judicial hub. He said: “We, therefore, resolved not only to complete all stalled court projects, but also, to initiate new ones to meet the increasing demand for judicial services by our people. “In a country such as ours, where the justice delivery system is pretentiously federal, but manifestly unitary, our quest for having the most modern and advanced court houses and justice system cannot be completely achieved if we limit our judicial transformation agenda only to State Courts. Governor Wike emphasised: “Let it also be known that we have built this courthouse to serve and advance the public interest and not to satisfy any other self-promotive motives. Accordingly, we have fulfilled our duty as leaders who mean well for our country and its progress. “All that we ask in return is for the Federal Government to provide for the regular care and maintenance of this building, so that its functionality is preserved for the use of the present and future generations”, he demanded. Commissioning the Court complex, Justice Auta stated that the Federal High Court complex in Port Harcourt was outstanding and the best to be constructed by a state government.